What kids are learning: Nancy's latest adventure is a less-than-thrilling exercise in a great deal of aimless wandering through a Bavarian estate which has little to offer an inquiring mind, save for providing a compelling case for hiring a good German proofreader. 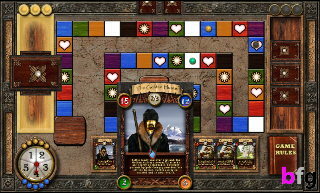 Rich environments and some occasional facts about German culture and history make this game not totally bereft of educational value, but mostly players' patience for puzzle-solving will be put to the test in a game that has much the frustration of old school point-and-click adventures, but little of the charm. In Nancy's 24th outing since Her Interactive started producing the Nancy Drew game series, Nancy is asked to investigate the mysterious goings-on at a small castle in the Bavarian region of Germany whose reputation as a tourist destination-spot is being ruined by the untimely re-appearance of a local legend: the monster. In order to solve the mystery, Nancy needs to talk to the locals, hunt for clues, play games with her hosts, and solve various puzzles to gain access to areas and information that will help her hunt down the monster. As she explores the relatively small Burg Finster, it becomes clear that the monster has plans to make Nancy his next victim. The production values are reasonably high for this type of game: the animation won't win any awards but they were smooth and reasonably well-rendered; the environments were nicely detailed, if repetitive; and the musical score, while also somewhat repetitive, seemed like it would have been right at home accompanying a night of PBS's Masterpiece Mystery Theater. Yet, the polished presentation was not enough to overcome my feeling that Nancy's just phoning it in these days. In the spirit of fairness, there are two disclaimers I should make before starting this review: 1) This game is not an overtly educational game. It bills itself as "a mystery adventure," and reviewing it from an educational angle may be akin to seeking wisdom from Hollywood blockbuster. 2) I have a love/hate relationship with point-and-click adventure games. When they're clever, I want to love them, even if I can't quite figure out what step comes next. But I often don't have much patience for the lateral thinking that these games require, particularly when designers make it all but impossible for players to rationally deduce the "right" solutions. Some of the criticisms that will follow in this review should be be read with these facts in mind. I've got my eye on you, Nancy Drew!! The game puts players in the shoes of the titular young sleuth, and the majority of your time as Nancy Drew will be spent clicking your way through the Finster estate, looking for clues and chatting with the castle's four main inhabitants. One immediate problem I had with the game was that navigating the castle was surprisingly more cumbersome than I expected from a point-and-click adventure. Clicking to advance to a new areas did not move Nancy a consistent distance each time, making it somewhat easy to become disoriented, even when I knew the overall layout of certain areas (particularly the forest and underground passageways). I also found it a bit odd that Nancy could only do a 360° view of a handful of areas, and sometimes getting Nancy to go where I wanted her to go required 2-3 more clicks than seemed really necessary. These quibbles would be minor if Nancy didn't have to spent the bulk of the game investigating the same 3 main areas (the forest, underground passages, and the castle building) over and over again. It soon become tiresome trying to remember how to get out of the woods for the umpteenth time, and I always found myself getting turned around in the Gift Shop. It didn't make the game unplayable by any means, but it did affect the pacing. I felt like half my playing time was actually time wasted trying to figure out how to move through the castle, rather than time spent "investigating." Aside from moving through the castle looking for "clues" (ie., clickable items in the environment), Nancy spends a lot of time chatting with the locals. This is primary means through which the plot is advanced and is is the means by which Nancy must figure out who's behind the hijinks in the castle. To talk to the characters in the game, players have only to click on them to prompt a greeting and provide a list of conversational options for Nancy to pursue. Although Nancy is presented with a lot of conversation choices when she interacts with members of the castle, this part of the game is essentially just an interactive storybook. Nancy's choice of what question to ask and when seems to make no difference--the conversation tends to end up revealing the same information no matter what topics Nancy chooses. Choices also never really disappear. Nancy can ask many or no questions when she first encounters a character, and any unasked questions will remain on the menu until players finally decide to ask them. As a result, I never really felt like I was in charge of the investigation. It is true that certain new questions won't appear as options until Nancy has exhausted certain choices, but players aren't required to use any skill or finesse in their questioning. They're mostly expected to simply make sure Nancy eventually reads all of her lines. The various puzzles in the game fall into two categories: first are the "puzzles" that Nancy needs to solve in order to move ahead in the game's plot and solve the mystery of the monster. In this respect, I found the game to alternate in challenge from the glaringly simple to the vastly unintuitive. One example of an overly simple puzzle occurs when the monster actually attacks the Burg's inner courtyard, setting fire to a plant. Nancy has to put the fire out, and conveniently, there's a well nearby. While the solution to the puzzle is pretty obvious from the get-go, it's made even simpler by the fact that Nancy cannot leave the area of the fire. Players have absolutely no choice to make--they must click on the well, get a bucket of water, and douse the fire in order to continue playing. Contrast this with a puzzle in which Nancy must set a clock in the Gift Shop to a specific time. In order to do so, she must have a key to wind the clock. However, there is no indication in the game as to where such a key might be found. Nancy's ever insightful "I need to find a way to wind the clock" prompts were no help. I eventually had to consult an online FAQ to figure out that I had to lead two different characters away from their posts and snoop around in their desk drawers to find the clock key. Because there is no correct order to solving plot puzzles, it is possible that not all players would experience the difficulty I did, but it seems likely that there is at least one such unintuitive bit to stump players no matter how they conduct their investigations. The second category of puzzles to appear in the game are much more along the lines of brainteasers. There are several of these that must be completed for players to uncover new clues, unlock secret areas, and even to escape danger. Most are not overly difficult, although players may have to think about them a bit to figure out how they work. The more frustrating puzzles are the few that have a time limit, and this is largely because the time limit is unspecified. Again, they are not especially difficult, but players can expect to fail to complete them quickly enough at least once or twice, and failure will result in Nancy's adventure ending abruptly. Fortunately, the game does have a well thought out autosave system, so players can instantly start a puzzle again with virtually no penalty if they fail to succeed on the first try. A game within a game, and you have no option to say "no." Certain other puzzles in the brainteaser category are of the game-within-a-game type. Both the Bürgermeister Karl and with the impish young Lukas have different combination board/card games that they want Nancy to play, and while she can decline to play at first, she must play both games at least once to advance the plot. The games are fairly clever, but I found Karl's Raid game to be far too time-consuming for my liking, particularly for a game that largely involved more luck than skill. Maybe some players will enjoy these games, but I personally felt that they were classic examples of flawed game design in that they were mandatory wildly atypical levels. Why do I have to spending 20 minutes playing a board game when I'm actually here to investigate an interactive mystery? These mini-games may be robust enough to stand on their own, but in the context of a mystery game, it simply feels like filler that the designers added to distract players from their undirected wandering around castle Finster. My last gripe about the overall gameplay involves the ways in which Nancy Drew can "die." A hallmark feature of the point-and-click adventure genre is the unusual deaths that the main character can, quite literally, stumble into. In the early King's Quest games, Sir Graham could barely take two steps without falling into a moat, rolling rocks onto himself, or drowning in a lake. Nancy is thankfully not nearly so hapless, but occasionally, her death is contrived enough so as to be annoying. One example is when Nancy discovers a trap door in the dungeon. Once she opens it, no matter how many times she observes aloud that she should be careful around the trap door, it is apparently completely impossible for her to walk around the gaping hole in the floor. Any attempt to move Nancy will result in a nasty fall, even though the door itself only take up a small portion of the floor in the room. This seems to be one way in which the game tries to coerce players into discovering that there is more to this room than meets the eye, but it's a contrivance that also serves to make players feel like Nancy is shamefully and inexplicably idiotic. The death by trap door is also fairly representative of the kind of untimely end that Nancy can meet. 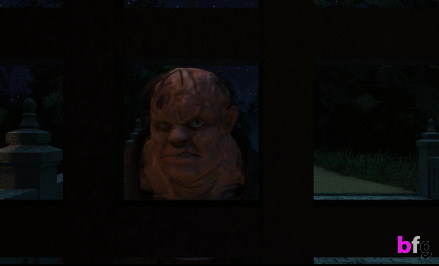 While none of the "deaths" are in any way gruesome, some did take me a little by surprise. I was definitely taken aback when I managed to inadvertently incinerate Nancy Drew. Yes, incinerate. Nancy can also be subject to personal violence from the monster, which again is depicted very tamely, but could possible take more sensitive players by surprise. As mentioned at the start of this review, The Captive Curse is not an explicitly educational game. It straddles a line between edutainment and pure entertainment, and there is no claim to attempting to teach players anything specific. Yet the game does convey, both through mechanics and the presentation of setting and characters, certain values and assumptions which are worth unpacking in any game targeting young players. 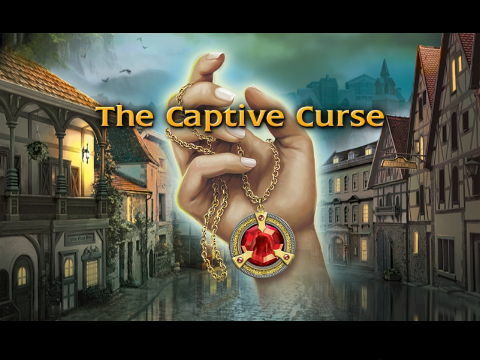 Moreover, The Captive Curse does contain some explicitly educational components worth mentioning: Nancy finds materials scattered throughout the game that briefly describe German history, culture, and language, mostly as it pertains to fairy tales. 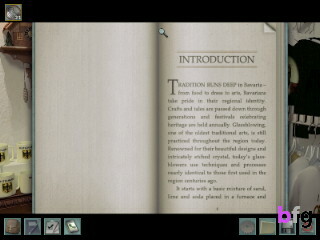 Take a look, it's in a book... it's Grims' Faerie Tales? 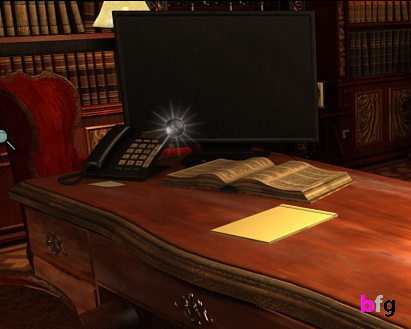 Among the overtly educational parts of the game, most are presented through the very standard mechanic of Nancy reading a book or newspaper clipping. Unfortunately, most of the material presented in this way is not really meant to be retained by players. While Nancy is incentivized to look at the five or six books available for reading in Castle Finster, she mostly only has to open the books to discover clues, rather than learn any of the history or culture contained in them. The only time when a certain amount of retention is required is when Nancy reads the castle's newsletters and gets a brief German vocabulary lesson--these translations will be needed in order for Nancy to successfully decrypt three secret messages. However, in both the Junior and Senior detective difficulty modes, as soon as she encounters a new term, Nancy automatically writes the German vocabulary down in her in-game journal (which players can access at any time). Of all the times where the game spares players backtracking through the castle, it is oddly provided at the one time when players might have been incentivized to learn something that could be applied outside the game world. If I can find errors in your German, there's a problem. But perhaps it is just as well that players aren't encouraged to pay serious attention to the German presented in the game, as there are several embarrassing errors in the German in the game. One of the most noticeable appears on a placard which Nancy must translate to solve an important puzzle. Nancy fortunately translates as if by magic with her Pocket German to English Dictionary. I say "as if by magic," not just because Nancy apparently becomes fluent in German grammar as well as vocabulary after a quick glance at the dictionary, but because she is also apparently unfazed by the placard's errors. Although the German language has many quirks, I can think of no occasions in which having three consecutive r's is grammatically correct. 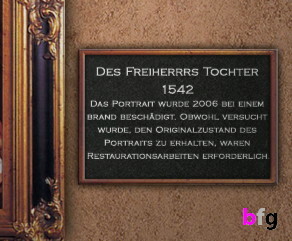 Yet the portrait is titled "Des Freiherrrs Tochter." A little proofreading could have gone a long way here. [It is also not clear to me that this is actually how Germans would say this. "Die Tochter des Freiherrn" or "Freiin" may have been more accurate.] A similarly simple error appears on a bookshelf in the gift store that holds some cleverly titled books, among which "Hossenfeffer" is not one. Maybe that's how Yosemite Sam would have spelled it, but the Germans spell it "Hasenpfeffer." I appreciate that the game does like to drop in quirky bits of humor, but it simply seems inappropriate to stick a bad Anglo-phonetic spelling of an actual German word into the game for no apparent reason. Along those same lines, the accents put on by the game's voice actors was also slightly less than impressive. While it is actually a joke within the game that the employee's costumes represent the "theme park version" of Bavarian history that the castle's owner, Markus, forces upon the employees, the accents also seemed to come straight out of a theme park--this time with no irony intended. I was already disappointed by Nancy's listless and gravelly voice which seemed more appropriate to a bored, middle-aged telemarketer than a young and ambitious teen-detective, but when the Gift Shop manager Anja spoke, I started to appreciate that at least Nancy wasn't trying to put on a terrible accent. Unfortunately, Anja has a considerable amount of dialog, making her erratic accent that much more noticeable. 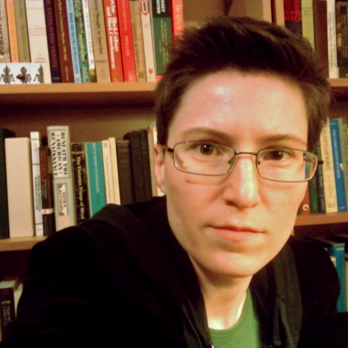 And Anja was not alone in sounding rather stilted and exaggerated. Even though most children and their parents are not likely to be put off by this, it seemed unfortunate to caricaturize German accents thusly. Nancy Drew, pilferer, at your service! But in fairness, the game isn't Nancy Drew Teaches German, it's a mystery game and Nancy has bigger fish to fry than some typos on a placard. So what does Nancy teach young players about being an international super-sleuth? In a most un-Nancy-Drew-like fashion, the Nancy in this game is perfectly okay with pilfering money from all over the Castle Finster. Early in the game, a character explains Nancy that this is okay because "people are always dropping coins around the castle." But frankly, it still felt wrong. The Nancy Drew I grew to know and love would have tried to find the person who dropped the change so she could return it, or she would have donated the change to the Finster estate. She would never have pocketed a good fifty Euros in change so that she could buy more items in the Gift Shop. Perhaps if Nancy only ever found coins lying on the ground or stuffed deep under seat cushions, it might have been less troubling to me. But Nancy finds coins in all kinds of places, even going so far as to take coins off the Bürgermeister's desk after she's lured him away on false pretenses! Of course, players don't have to take the spare change. In fact, you never need more than 10 Euros to finish the game, and Nancy starts out with 15. But failure to pick up every stray Euro means than players will not get the "Treasure Hunter" award at the conclusion of the game, so pilfering is indeed rewarded in The Captive Curse. And failure to spend lots of Euros in the Gift Shop means that you will not receive the "Keepsake Kitsch" award "for buying castle mementoes." I really couldn't fathom what purpose these two awards served, or why players should be rewarded for making Nancy scour the Finster Estate looking for change, simply for the sake of hoarding novelty goods in the closet in her room. But the greatest frustration in this game by far was that the spirit of investigation seemed largely crippled by the mechanics of navigating that game world. I know I complained about the navigation in the "gameplay" section of this review, but from a technical perspective the navigation was merely tedious. From the perspective of how it suited a "mystery adventure" game, I frankly found it to be dreadful. Players' impulses to explore their environment are tightly constrained in this game. Although environments are detailed, there's little room for players to interact with that environment. Many screens in the game in fact have nothing in them that Nancy can explore--they exist only to be walked through. And details in the environment could also be misleading. For example, there were several doors in the main building that were visually prominent, but that Nancy was apparently meant to take no note of. They could not be selected in any way; players were merely supposed to glide right past them without pause. Sadly, so few of the details of the game environment were selectable that I soon learned to actually abandon my own visual detective skills and merely moved the mouse around the screen, waiting for the cursor to change and tell me that there was finally something relevant on which to click. In essence, this was an investigation on rails, not one in which players were encouraged to really scrutinize their environment or flex their own detective muscles. Had more things been selectable, possibly with the inclusion of very simple feedback mechanic, like a response from Nancy like, "no, that isn't really a clue," players might have felt a greater immersion in exploring the Burg Finster. she's excited to have finished this game! I still love reading and re-reading the old Nancy Drew mysteries. Nancy was smart, she was courageous, perhaps a little too daring sometimes, but always loyal, just, independent, and resourceful. In short, she was a fantastic role model for young women in a time when fictional female role models were sparse. I think Nancy still can be a fantastic role model for kids today, but the Nancy in The Captive Curse was, to me, slightly less than the Nancy I knew and loved. I spent a large portion of the game simply wandering from room to room in the Castle Finster, exhausting my dialog options with my four suspects and waiting for some kind triggered event to begin that might give me a hint as to where I should explore next. There are some moments of urgency and suspense in the game, but they were too few and far between. I wanted to feel immersed in a mystery, but instead I struggled with boredom and too many immersion-breaking moments like poorly proofread German and an excess of inexplicably-appearing brainteaser puzzles. It made me sad to think that Nancy's mystery solving these days involves little more than treading repeatedly through stale environments, dealing with whiny boyfriends and poor cell phone service, and asking countless uninspired questions of her suspects in a listless tone. By the end of the game, I could only wonder if poor Nancy had been as bored by Castle Finster as I was. Hopefully her next adventure will be more inspired. 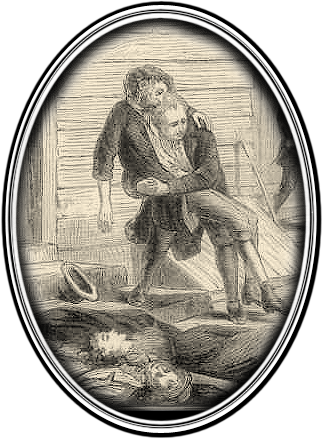 Yes, I did just use a terribly punny headline to remind you that my interactive story about life and death during the Yellow Fever epidemic of 1793 is now available, totally for free, over at The Appendix. Over 45,000 words with 200+ unique passages and 20 different endings. So what are you waiting for? 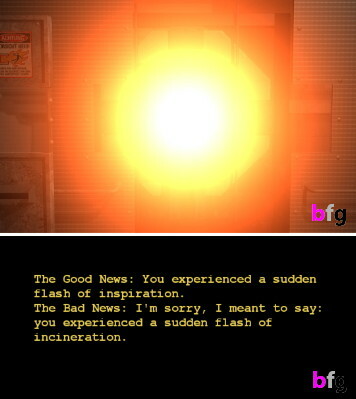 Go play The Fever! now. A huge thanks to everyone who watched the live stream and donated to my 2014 Extra Life campaign. In 2014 alone, Extra Life gamers around the world raised over $5 million for Children's Miracle Network Hospitals, and we couldn't do it without your support. Looking forward to 2015! Is there a game you like to see reviewed? your request! Extra Life Marathon 2013 is over. All content, text, reviews and brainsforgames logo © 2011-2015 by brainsforgames, unless otherwise noted. All game artwork © their respective owners, used here under fair use guidelines.